In January, Kabir bought grocery worth $20 from Kroger for dinner for all four of us. He decided to serve Tortellini with Pesto, Kroger Garlic Bread (as buying Kroger garlic bread was cheaper than buying ingredients and making it at home), Kroger Sushi and Grapefruit. 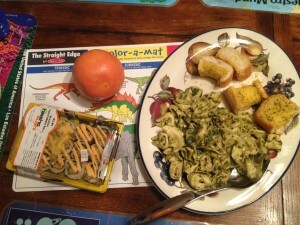 He bought pesto and grapefruit from me as we already had it at home. This time he saved $1.22. Adding the previous saving, he now has $2.90. Maybe one day he will save enough to buy us a feast! Also, he made the tortellini with pesto. He added more pesto than I usually do and it was more delicious than mine. He can’t wait to do it again for the month of February.